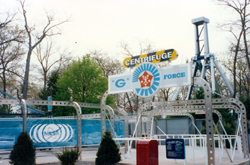 Very few guests who visited Great Adventure during its first nineteen seasons were prepared for what awaited them in 1993. 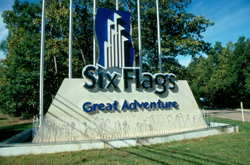 Time Warner was now in total control of the park for the first time and they jumped in head-first to making their presence known starting with a new highway sign on Route 537 featuring Six Flags' new corporate logo. The company's mission was to offer locals a Disney-style trip in a park that was "bigger than Disneyland but a whole lot closer to home." 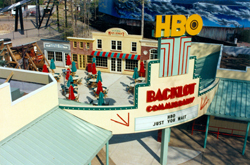 Just like at the Disney parks, employees became cast members, themed areas were defined, and new paint, signage, and renamed rides and attractions filled the park. Missing from the ride lineup for 1993 were Lightnin' Loops (which was replaced for construction of Batman The Ride), the Shockwave stand-up coaster, and the Traffic Jam bumper cars. 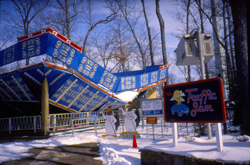 Traffic Jam had to be removed unexpectedly after a harsh late-winter storm destroyed this original attraction at the park making 1993 the first season without this type of ride. 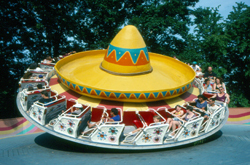 To makeup for the reduced capacity, the Schwabinchen ride was taken out of mothballs and made a mid-season return to the park as El Sombrero after being removed at the end of 1986. Great Adventure would now be divided into nine new sections each rivaling the quality theming of the recently added Adventure Rivers area. Overgrown landscaping was replaced with new shrubs and flowerbeds and some would argue that a few too many trees that made Great Adventure unique were removed to make the new park vistas seem even more impressive. 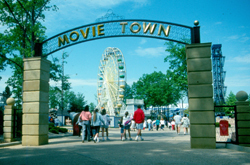 A new park-wide sound system piped out music to match each area with movie themes in Movie Town, ragtime favorites in the Boardwalk, and fife and drum music in the colonial themed Main Street section. 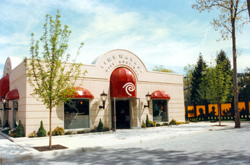 Time Warner invested heavily to promote its "new" theme park with increased advertising in both print and on television. 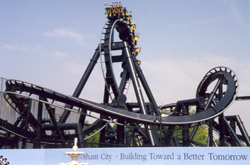 This in combination with the new Batman The Ride inverted coaster and numerous festivals throughout the season paid off as the park saw at 10% jump in attendance which brought it back to the record high level it experienced in 1983.